LaDelle Idalene (Perry) Lytle was born February 6, 1935 in Riverside California to Bryan and Frances Perry. LaDelle had a wonderful childhood in the small town of Molalla Oregon. 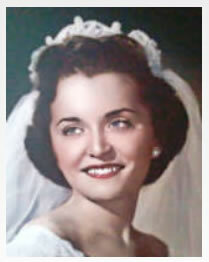 She graduated from Molalla Union High School in 1954 and moved to Portland to attend business school. She worked for a short time in the banking industry and lived in an 'all girl' apartment building and recounted these times with great happiness. In June 1957 she married her high school sweetheart James C. Alexander when he returned from the Navy and their son James Bryan was born 15 months later. The small family moved to Eugene and in the next few years Eric, David and Ayn were born. LaDelle took care of many foster children, specializing in infants. Her love wasn't limited to humans and any animal, large or small that was injured found its way into our laundry room for medical care, food and love until it was able to fly, crawl or swim away. When her youngest started school LaDelle starting working part time at North Eugene High School as a clerk in the counseling center. She had many friends from NEHS and her neighborhood. LaDelle and Jim were married for 36 years when sadly they divorced. In 1994 LaDelle's friends set her up on a blind date and she met Bruce L. Lytle. As she described him, a tall handsome man with beautiful silver hair, a gentleman. They married in December of 1995 and had many happy years together. They rescued three wonderful, funny dachshunds Sophie, Wally and Dexter. Many times LaDelle described Bruce as 'the love of my life'. They bought a home in Springfield and together made it into a lovely sanctuary for family to gather in for holidays, birthdays or summer evenings on the back porch. Bruce and LaDelle loved to travel, cruises and tours to fabulous locations often with LaDelle's brother Allen and his wife Nancy. They loved to pack up the car with the dogs and go to the coast. They were "foster parents" for dogs at Greenhill Humane Society and would often have an extra dog in their home. Somehow we all ended up with 'one of mom's dogs'. LaDelle was diagnosed with cancer 15 years ago. She rarely talked of illness and it rarely stopped her from her activities. She passed away in her home on July 2nd surrounded by her husband, children and the pets she held dear. We have reassurance that she is healthy and whole in heaven now, reunited with loved ones who have passed on before her. LaDelle leaves behind a loving husband, Bruce, sons James, Eric and David Alexander (his wife Karen) and a daughter Ayn (Alexander) Holt along with her husband Gregory. Step son Donald Lytle his wife Syndey and their family. Grandchildren Kyle, Shelby, Austin, Melissa and Mathison Holt. She had 4 great-grandchildren. A public memorial picnic will be held Saturday September 7th at the home of Donald and Syndey Lytle, 42916 Leaburg Drive, Leaburg Oregon at 12 noon. The family would like to invite all friends of the family to attend.